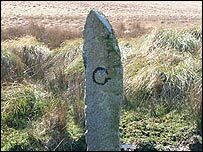 Local historians have celebrated the completion of a project to record ancient boundary stones across Bodmin Moor in Cornwall. The granite stones were originally used to mark property lines between adjoining landowners. Many of the stones were buried during World War II to prevent enemy troops being able to use them for guidance. Local schoolchildren have been involved in the scheme to locate the stones on Bodmin Moor and repair damaged ones.